THIS Is The MOST Effective Way To Decalcify Your Pineal Gland and Open Your 3rd Eye! The pineal gland is a hormonal gland in the deep recesses of your brain. This pea sized organ has a big effect not only on your body but your spirit as well. The brain has many secret abilities and processes. The pineal gland is found in every vertebrate animal on the planet. The chemicals produced by it are the common denominator for all higher life forms. To maximize the pineal gland and the surrounding grey matter is to take yourself away from the basic instincts of life and delve into the mysteries and powers of the human condition. That’s how you increase the power of your consciousness. There are countless methods for decalcifying the pineal gland and opening your 3rd eye! However, there is one proven to be most effective, far more from any other. People who’ve tried this are unrecognizably better versions of themselves overnight. What’s this extremely powerful method we speak of? It’s more of a drink than a method and it’s called Ayahuasca! The Ayahuasca vine mixed with the leaves of the Chakruna bush, makes a sacred tea. 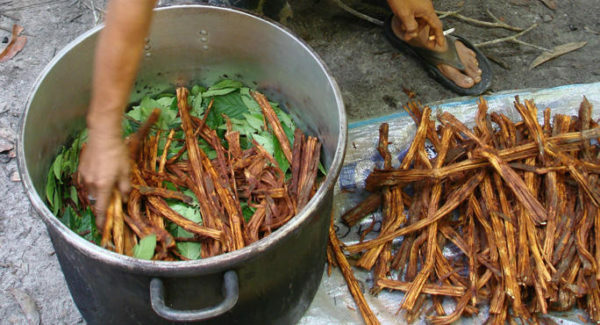 This concoction is considered to be the pinnacle of herbal medicine out of the Amazon. There are thousands if not millions of first hand accounts stating profound healing on psychological, emotional, spiritual and physical levels. Neurologically speaking, the chemicals of this tea cleans out every synaptic chain and neural cell in the brain. As it runs through, removing build up, it simultaneously activates and stimulates the brain’s pituitary system, hypothalamus and pineal gland. This process is called methylation. A variety of synthetic chemicals and toxins (fluoride and heavy metals being the most prevalent) are readily lodged in the fatty tissue of the brain, effectively blocking neural synaptic firing and disrupting the brain’s natural electromagnetic flow. With over 44,000 toxic chemicals introduced into the every man’s environment since the industrial revolution, we could all use a good brain scrubbing.